Speaking at LeWeb London ’12, Joe Fernandez, Co-Founder & CEO of Klout shared that his influence measuring service is to expand how it monitors its users’ reach by measuring how they influence people offline as well as rolling out a new algorithm update in the near future. 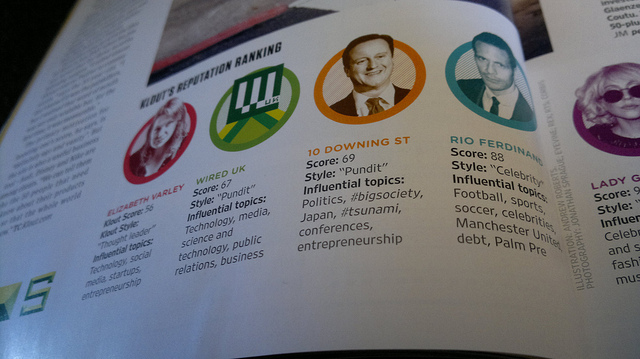 Staying quiet on how Klout will attempt to measure someone’s ‘real world influence’, Fernandez said that the company was at “the start of an interesting way of doing that,” using Warren Buffett as a example of someone who could be recognised for their influence offline. You’ll know Klout as the service that connects with your Facebook, Twitter, LinkedIn, Google+ and other social networks and measures how well you know topics or how much influence you have over them amongst your friends and followers online. Back in October 2011, Klout amended its scoring algorithm, frustrating users to the point where Fernandez received calls from disgruntled ‘Klouters’ threatening his life. Hoping that such a change will be better received in 2012, the company is to do the same again, although we don’t know when. Fernandez says that there will be “way more signals” used, topics will be continually refined in order to make them more relevant (an example used in the LeWeb talk demonstrated that TechCrunch founder Mike Arrington was influential in garlic), also gaining more insights from what people in a user’s networks talk to them about to determine what people are looking to others for feedback on. Klout has already raised $70 million in funding and is engaging brands via its Perks program. While many people love to hate the service, Fernandez and his team are pushing forward with their influence measurement platform, soon attempting to measure the things you are knowledgable far away from your social networking profiles. Read next: Facebook and safety: A behind-the-scenes look at what happens when you click "Report"